The 2018 ECHO Annual Meeting is taking place in the Battle River watershed from July 29—Aug 1st! Welcome to our ECHO summer update for 2018! Summer is in full swing in the northern hemisphere and appears to be zooming by amidst a range of activities within the ECHO Network! We have launched our collaborative platform ECHO Source, three of our Post-doctoral Fellows have or are transitioning into new roles, and our second Annual Meeting is upon us. Vanessa Sloan Morgan—former ECHO Network PDF has moved on to a Banting PDF Fellowship! Congratulations Vanessa, we look forward to continuing to connect with you as you pursue your new research project focused on youth & community in the context of resource extraction. We are pleased to announce that Dawn Hoogeveen will be joining ECHO as a new PDF starting in September 2018. Dawn will pick up important project threads from Vanessa regarding the design, conduct, and analysis of knowledge synthesis approaches across the project and other areas of focus such as the evaluation strategy for ECHO. Our Team Learning & Impact has been progressing evaluation plans for ECHO. Evaluation is a key aspect of the project but also of the Annual Meeting. Drafts of the plan and evaluation forms will be presented at the ECHO Annual Meeting. We would like to thank Dar Amsalu for his Research Assistantship with the Battle River Watershed Alliance Regional Case—Dar has been a key member of the re- search trainee team working on knowledge synthesis activities which have led to a recent publication on drinking water contamination (see also last page of this Update or click here). Thank you for your contributions Dar and best of luck with your new endeavours! As we are moving into Year 2 of the ECHO Network, we are shifting gear from our foundational governance work to a series of workshops, including learning & impact exchange and knowledge to action workshops. In July we launched our first ECHO Network Coffee Chats. Virtual coffee chats were discussed at the launch meeting as something that would allow fellow members who would not normally get the chance to interact the ability to talk to each other. The first chat was a success and the second coffee chat will happen sometime in August. If you have any questions or comments about the coffee chats please contact Alex MacDonald (macdona9@unbc.ca) or Diana Kutzner (diana.kutzner@unbc.ca). The ECHO Network Annual Meeting will be hosted by the University of Alberta and the Battle River Watershed Alliance in Camrose, Alberta. You should plan to arrive in Camrose on July 29th; the meeting is scheduled to end in the afternoon of Aug 1st. ECHO related team meetings will take place in the following days (Aug 2-3). Please email Diana Kutzner (diana.kutzner@unbc.ca) in case of questions. Some ECHO Network team members are looking ahead to the 7th biennial conference of the International Association for Ecology and Health in Cali Columbia; see also http://ecohealth2018.co/. Living Waters Rally 2018 hosted by the Canadian Freshwater Alliance in Moncton, New Brunswick. Freshwa ter advocates from across the country come together to learn from each other, dialogue, and strategize to bet ter defend freshwater. The Rally brings together people from diverse backgrounds, including the non-profit sector, First Nations, local governments, academics, students, recreationalists, and concerned citizens. The next ECHO Network Annual Meeting will be hosted by the Université de Moncton and NBEN in New Brunswick. Dates will be identified and announced as soon as possible. Brisbois B, Reschny J, Fyfe T, Harder H, Parkes MW, Allison S, Buse C, Fumerton R, Oke B. (forthcoming). Mapping research on resource extraction and health: A scoping review. The Extractive Industries and Society. Wanzor works on the New Brunswick case study within ECHO under the supervision Céline Surette and Julie Forgues of the Université de Moncton and in partnership with Pays de Cocagne Sustainable Development Group NB and the Children's Environmental Health Collaborative.This study aims to analyze the benefits and challenges of arts-based tools in the emergence of actions and possible solutions to complex problems related to the impacts of natural resource development. It also plans to evaluate the types of links that participants make between the health of their watershed, children's health, and human activities in their territory; and describe how arts-based tools can bring out new perspectives for vulnerable populations with a diversity of voices in actions and help find solutions to reduce inequities and foster knowledge integration. To do this, two different projects using the Photovoice method are planned to assess if and how art-based tools help strengthen the resilience of communities to the cumulative impacts of natural resources development. One will be done with students from two elementary schools that will lead them to better understand the catchment concept and see themselves in their environment; and the other will be done with members (adults) of the New Brunswick Children's Environmental Health Collaborative to design a workshop on cumulative impacts and children's health. All of us here in the Battle River Watershed Regional Case are excited to welcome many of you to Camrose, Alberta for the 2018 ECHO Network Annual Meeting in just a few days! We look forward to introducing you to a few of the landscapes that make this prairie-fed watershed so special. We face many challenges, but we also have a passionate community of people committed to protecting this beautiful place we call home! Municipal partnerships have been an important focus of our work over the past few months. The BRWA hosted two Municipal Watershed Forums aimed at connecting with municipal staff and councillors on topics of watershed education, steward- ship, and management. These forums also provided an opportunity for us to introduce our municipal partners to the ECHO Network and some of the ways we’re seeking to integrate environment, community, and health in our watershed work. ECHO Research Assistant Dar Amsalu has also been connecting with several municipal representatives through interviews focused on looking into the environment, community, and health data needs of municipalities in the Battle River watershed. In June, we were able to introduce more watershed residents to the ECHO Network during the BRWA’s Annual General Meeting, as well as at the biennial Summit of Alberta’s Watershed Planning and Advisory Councils. The “echoes” of the Network continue to reach further into our watershed community! Next steps centre on progressing our work to develop a more integrated watershed health indicator framework. Battle River Echoes: Send us your photo with the BRWA emblem! If you attended the ECHO Network Launch Event in May 2017, you likely received a Battle River Water- shed Alliance (BRWA) pin that showcases the new emblem of our organization. You may also remember that we wanted you to do something with that pin. Well, now is the time! Before the 2018 ECHO Network Annual Meeting (July 29-August 1), we’d like you to take a photo withthe BRWA emblem pin in one of your favourite watershed spots. Then, email it to Sarah Skinner (Regional Coordinator of the Alberta ECHO Regional Case; sarah@battleriverwatershed.ca) with a short description of that place and what it means to you. You don't necessarily need to be in the photo, but the pin does. And if you lost your pin or didn't receive one, fear not! You can still participate! Just print this page off, cut out the emblem, and use it instead. One of the greatest benefits the BRWA has already experienced through the ECHO Network is connect- ing with incredible people from across Canada and around the world who are caring for their watersheds in unique and powerful ways. This inspires and informs our work here at home, and these emblem photos areone way to visually show how “echoes” are reaching from far and wide across the Network to land here in the Battle River watershed. We’re also grateful to be able to contribute our voice to the “echoes” of the Network. The FNHA Regional Case team has been busy presenting around the province! Early May 2018 kicked off the presen- tations at the Columbia Mountains Institute of Applied Ecology: Interdisciplinary Approaches to Managing Health of Fish and Wildlife Conference in Kimberly, British Columbia. The presentation introduced the Local Environmental Observer (LEO) Network to the group and how it could be used for the surveillance of ecological changes. The LEO Network was well received and the Tahltan Central Government and Tahltan Guide Outfitter Association invited us to present at the Northern Wildlife Symposium in Dease Lake, British Columbia in early June 2018.
disturbance maps he has been working on and Dionne Sanderson (Regional Coordinator) introduced the LEO Network. It was an excellent symposium. 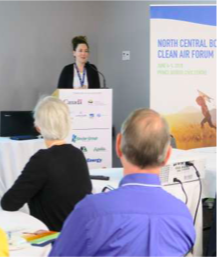 The disturbance map stimulated some great conversations among attendees around resource development and the LEO Network was viewed as a valuable tool that could be put to use in the northwest BC. be found on the CIRC website. Chris Buse, CIRC Project Lead, was awarded a CIHR Fellowship supported bythe University of British Columbia’s Centre for Environmental Assessment Re-search and UNBC. This project will explore how to incorporate health impera- tives and the determinants of health into provincial and federal environmental as- sessments. Marieka Sax, CIRC Operations Lead, was awarded a SSHRC Innovation Development Grant. This project will examine the gendered impacts of the speculative phase of resource development in two case study sites: a proposed tungsten and molybdenum mine in Stanley, NB and a proposed liquefied natural gas (LNG) export terminal in Kitimat, BC.